A day hike to Looneyville, Big Cypress! Hiking to Tarpon Lake in Big Cypress with the Florida Trail Association. 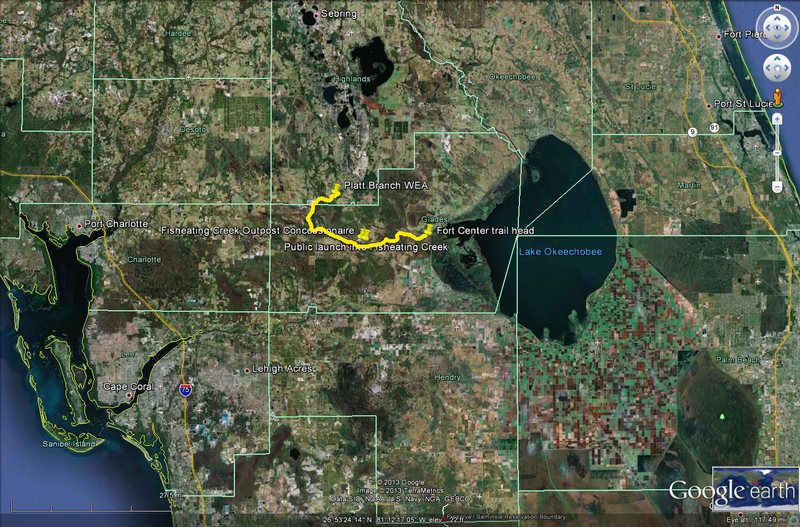 Tamiami Trail to Alligator Alley the HARD way – Through hiking the Big Cypress National Preserve. Bird’s eye view aerial of Fisheating Creek at Ingrams Crossing dry season edition. CLICK for full screen VR 360 Panorama ! So if a journey of a thousand miles begins with the first step, then a new site begins with the first post! 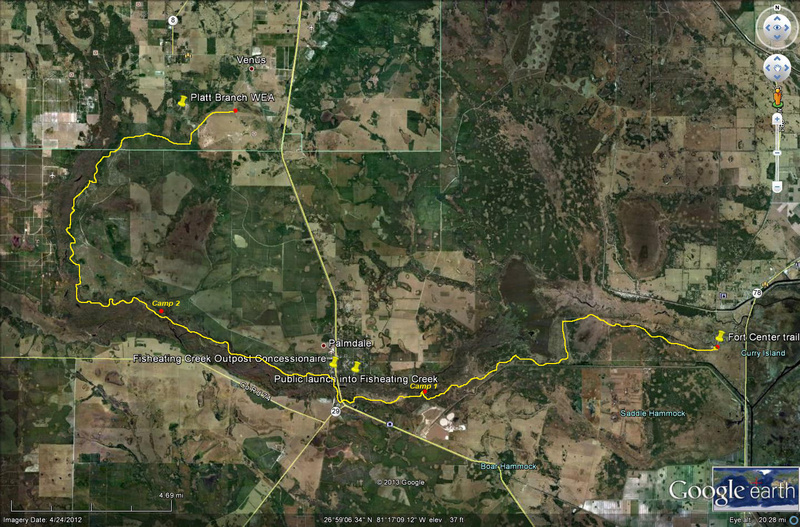 What better way to fire off this site than with a 3 day, 36 mile through-hike of beautiful Fisheating Creek in Palmdale, Florida.. The Fort Center area has a lot of history and there have been some major Native American archaeological digs there. It’s a great place for day hiking! CLICK for zoomable superwide fullscreen VR panorama ! I’m showing one small thumbnail, but there were many life-size Cow dung patties in this section! These lil piglets didn’t sniff us out until almost right on top of us! We saw lots of cows, hogs, some deer and several Swallow-tailed Kites flying around. It was nice and quiet too, no machinery noises. This individual did not make it out! Our feet were dry until we had to cross this small bog on the fringes of Cowbone Marsh. Dinner with sunset over Rock Lake or is it Paradise Lake? After a day of peaceful hiking we had to sprint across Hwy 27 with trucks barreling down. Just across the higway are the remains of the Tom Gaskins Cypress Knee Museum which was once a main attraction here. Today, (sadly) it has the look of a crackhouse.. The Fisheating Creek Outpost store sells water, drinks, snacks and also has a boat launch ramp with canoe / kayak rentals available. Tarzan on the famed tree swing at Fisheating Creek .. thump chest as you let go! Filtering more water .. MUST_HAVE_WATER ! No magic here -not a mushroom to mess with ! Beautiful Live Oak everywhere around .. grow crazy like octopus tentacles! Beauty in the simple details and light! I saw this from a distance – the light and the color combo is what makes this shot! Several long segments were along the perimeter fence with Lyke’s Bros property – which was just recently plowed over for a fire break. If you’ve ever tried walking across a freshly plowed field – you know! Hiking along perimeter fence felt like Boot Camp! Platt Branch is mostly scrub / pine type habitat and we walked on sandy dirt tracks. Platt Branch is a great place for birding, but the deep sandy trails can be challenging. © 2013 Flex Maslan / Awakenthegrass.com / digital029art.com. All original photographs, artworks and music in this portfolio are copyrighted and owned by the artist, Flex Maslan, unless otherwise noted. Any reproduction, modification, publication, transmission, transfer, or exploitation of any of the content, for personal or commercial use, whether in whole or in part, without written permission from the artist is strictly prohibited. DISCLAIMER:: The maps and images on this site are not intended for navigation, I am not a guide; use any and all information at your own risk! Your mileage may vary .. so be prepared and use good judgement before venturing out!